Switched by Amanda Hocking is a beautiful and enchanting paranormal novel about a species I've never read about before in YA -- the Trylle! Which is basically a prettier way of saying "troll." Hocking does a great job creating an entirely new mythology about the Trylle and their way of life. Everything about them is explained clearly throughout the book, and I loved being able to learn about their way of life alongside the main character, Wendy. Wendy was relatable, and I liked her. She always felt like she was different from the kids at her school, and even different from her family. Her mother hates her and tried to kill her when she was six years old, but she has a loving aunt and brother. I really liked her aunt and brother, and hope to see more of them in the next books in the trilogy. When Wendy goes to live with the Trylle, she discovers in a very Princess Diaries-like way that she is a Trylle princess and is next in line for the throne. The book from that point on reminded me of a fairy tale, with the girl who is learning how to be a princess and feels like she just can't manage to do it right. If you love enchanting fairy tales, then this will definitely be a book for you! Just like in many YA books, there were many guys vying for Wendy's affections! There was Finn, the hot Trylle who Wendy is forbidden to be with; Rhys, the hot human who is interested in Wendy but she is even more forbidden to be with; and Tove, the hot royal Trylle who would be an appropriate match for Wendy. I can't wait to see how her relationships with these three develop in the rest of the trilogy. I like them all, and I'm not even sure what "Team" I'm on yet! In conclusion, Switched is an enchanting tale that I loved and highly recommend. There was also a huge cliff hanger at the end -- I need the next book NOW! 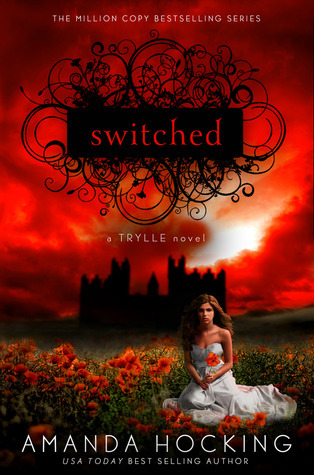 On the cover: The cover for Switched is gorgeous. The Trylle Trilogy has been on my to-read list for a while, but when I saw the new covers designed by St. Martins Press, I was amazed by their beauty and moved the books up on my list. The cover represents the enchanting feeling of the book perfectly! I loved this series when I read it on Nook before it was re-released by St. Martins. I'm really excited to get the new ones with the pretty covers, and I'm pretty curious to see if the story has changed any :0) Thanks for the review! I want to read this, I wish I could say I was cool enough to read her before she became well known. I saw a video on youtube of how Amanda Hocking went from making 12,000 dollars a year to becoming a millionaire--all from self-publishing. I think she is so insipring to writers and can't wait to read her novels.